but for the nosing I milled up some 8/4 stock, and chucked a stain nose bit in the router. Before installing the corners I pre finished the posts themselves. This would be a lot easier to do before the corners are install and also help prevent any raw wood from showing along the edges if the wood shrank during seasonal movement. I didn’t recorded it because at the time I thought it would make for boring video. If there are enough people interested, maybe I’ll go back and recreate it for a future video. But the operation itself is pretty straightforward. I used my shop made vertical sled to clamp the work piece and with the blade raised to the correct height and angle I made the cuts. I cut the cross grain 1st as it is more likely to blow out, and then cut with the grain 2nd removing any tearout form the cross grain cut. While the stain and finish was drying on the newel posts. I moved on to preping the stock for the spindles. Now it’s time to cut the joinery. I know a lot of people poo poo the domino because they think its not real woodworking or it cost too much or they just love to hate something. But for a small custom shop like mine when I need to finish a job before the next mortgage payment is due, this is the way to go. There was 72 of those little cross braces, I think the domino paid for itself that day. To assemble the spindle units, I screwed yet another jig to the table. The stop block at the top of the jig is cut at the same angle as the rise and run of the stairs to help me quickly align all the parts. Now all there is left ,is to add the dominos, glue and claps. To attach the spindles to the treads I simply doweled them, so once the assembly dried I routed out a slot in the bottoms of the spindles to receive the dowel. To do this I screwed a jig to the side of my assembly table to clamp the spindle assembly upside down so I could rout an oblong hole in the bottom of each spindle. The reason for the oblong hole is it gave me a little wiggle room in case one of the dowels in the tread was off. Once the glue set on all three dowels it was a solid assembly. The reason why am blowing out the hole with air, is my spiral up cut bit was so dull it made more smoke than sawdust so I’m using a spiral down cut just to get the job done, and it is driving the chips to the bottom of the hole. I should also mention that the big chunck of walnut scrap is only their to take up the extra space in the clamps so I was easier to clamp the work piece without the bars sticking way out in the way. 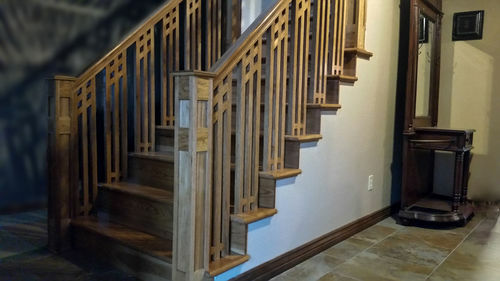 So here is some shots of the finished staircase and handrail. Reading your blog brings back memories of building and installing the railing and newel posts for the house we are living in now, as well as the railing and stair build and installation at the last house we lived in. It’s amazing how many little details pop up when you start actually fitting things into existing spaces. It’s also amazing how much time it can take and how much things cost. Your final product looks great. The video and blog are also well done, very informative and helpful. 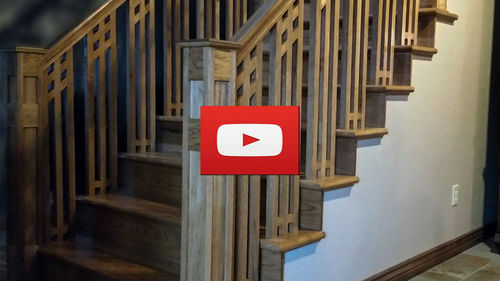 Reading your blog brings back memories of building and installing the railing and newel posts for the house we are living in now, as well as the railing and stair build and installation at the last house we lived in. It s amazing how many little details pop up when you start actually fitting things into existing spaces. It s also amazing how much time it can take and how much things cost. Thanks Earl, I did have quite a few head scratching moments while working out the fit and finish. It’s just part for the course on remodel job. That is some incredible work there! Very inspiring, I appreciate the contribution .